Add to your existing Arts and Crafts kit with our Mini Foam Dabbers. Supplied in a sizeable pack of 12, these durable dabbers have been manufactured with a hard wearing plastic handle and highly absorbent foam end. A great resource for smaller hands, each one uses high quality materials to ensure paints and inks are both collected and distributed well. 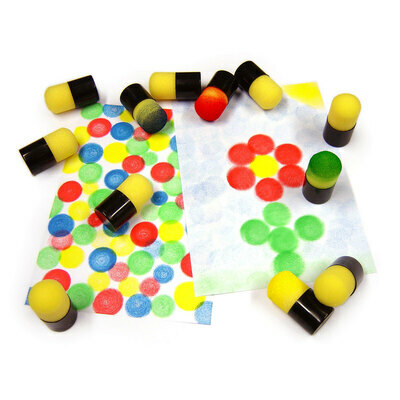 Use these foam dabbers to create vibrant flowers, smiley faces or bouncing balls across a rich Summer field - their imagination is sure to go wild when faced with the open ended possibilities these painting tools afford them. High quality materials are designed for the rigours of schools and nurseries. Make sure your prepared for each and every session by adding either our Ready Mix Paint 5ltr or our Gompels Ready Mixed Fluorescent Paint to your basket today? We also stock packs of paper to suit every need from our Super Value Activity Paper 200 Sheets through to our Basic Paper Pack A2, A4 and Card - all available here for exceptional wholesale prices.